She had Mrs Oglevie for a nurse and Dr Moore for physician. There was no word sent to the folks at home till it was all over. I dont know how I put in the day I was nervous I was nearly crazy. Sunday July 31st 1881 I was busy about the work a good part of the day, but wrote a letter to Birdie Harris, Lou Reeves and Mrs Anderson. I was tired and went to bed early. Monday August 1st 1881 I got the work done up and went up to Wins to practice awhile I worked on my burlap mat all the afternoon. 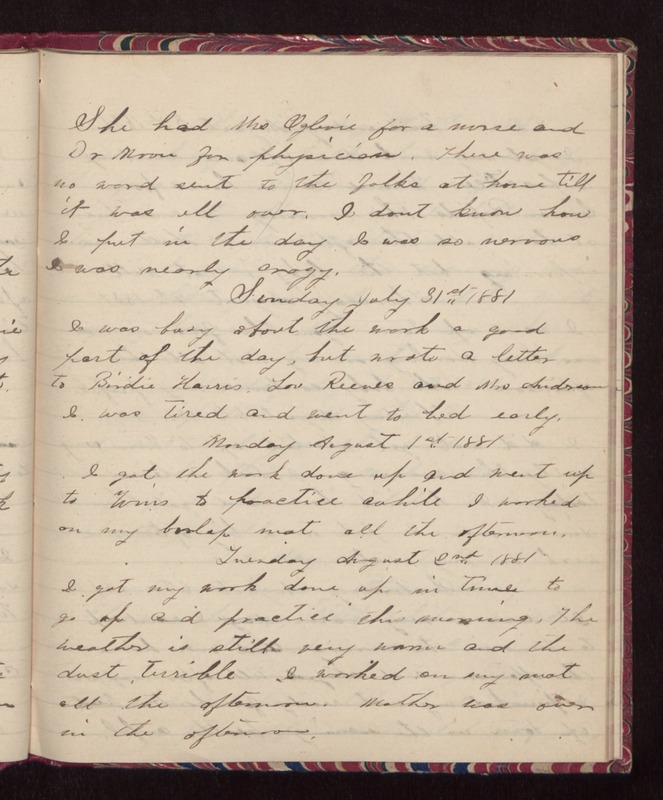 Tuesday August 2nd 1881 I got my work done up in time to go up and practice this morning. The weather is still very warm and the dust terrible. I worked on my mat all the afternoon. Mother was over in the afternoon.